ADULT KEY Author: Potter, M. A. Identification key to the genera of adult mosquitoes in the PACOM Australasian Region, adapted from Harbach and Sandlant with the addition of Verrallina. LARVA KEY Author: Gaffigan, T. V. Identification key to the genera of larvae in the PACOM Australasian Region, adapted from Harbach and Sandlant with the addition of Verrallina. ADULT KEY Author: Huang, Y. M. Adult identification key to the genus Aedes in the PACOM Australasian Region, with emphasis on medically important mosquitoes. LARVA KEY Author: Huang, Y. M. Larval identification key to the genus Aedes in the PACOM Australasian Region, with emphasis on medically important mosquitoes. ADULT KEY Author: Rueda, L. M. Adult identification key to the species/groups of Myzorhynchus Series of Anopheles (Anopheles) in the PACOM Australasian Region, with emphasis on medically important mosquitoes. ADULT KEY Author: Rueda, L. M. Adult identification key to the species of Neocellia Series of Anopheles (Cellia) in the PACOM Australasian Region, with emphasis on medically important mosquitoes. ADULT KEY Author: Rueda, L. M. Adult identification key to the species/groups of Neomyzomyia Series of Anopheles (Cellia) in the PACOM Australasian Region, with emphasis on medically important mosquitoes. LARVA KEY Author: Rueda, L. M. Adult identification key to the series of genus Anopheles in the PACOM Australasian Region, with emphasis on medically important mosquitoes. ADULT KEY Author: Pecor, J. Key to larvae of Anopheles subgenera and species in the PACOM Australasian Region, with emphasis on medically important species. ADULT KEY Author: Gaffigan, T. V. Identification key to the adults of Armigeres subgenera and species in the PACOM Indomalayan Region, with emphasis on medically important species. ADULT KEY Author: Rueda, L. M. Adult identification key to the genus Coquillettidia in the PACOM Australasian Region, with emphasis on medically important mosquitoes. LARVA KEY Author: Gaffigan, T. V. Larval identification key to the genus Coquillettidia in the PACOM Australasian Region, with emphasis on medically important mosquitoes. ADULT KEY Author: Pecor, J. Adult key to Culex Subgenera in the PACOM Australasian Region, with emphasis on medically important subgenera. LARVA KEY Author: Pecor, J. Larval key to Culex Subgenera in the PACOM Australasian Region, with emphasis on medically important subgenera. ADULT KEY Author: Pecor, J. Key to adult females of Culex (Culex) in the PACOM Australasian Region, with emphasis on medically important species. LARVA KEY Author: Pecor, J. Key to larvae of Culex (Culex) in the PACOM Australasian Region, with emphasis on medically important species. ADULT KEY Author: Pecor, J. Key to adult females of Culex (Oculeomyia) in the PACOM Australasian Region, with emphasis on medically important species. LARVA KEY Author: Pecor, J. Key to larvae of Culex (Oculeomyia) in the PACOM Australasian Region, with emphasis on medically important species. ADULT KEY Author: Rueda, L. M. Adult identification key to the genus Mansonia in the PACOM Australasian Region, with emphasis on medically important mosquitoes. LARVA KEY Author: Gaffigan, T. V. Larval identification key to the genus Mansonia in the PACOM Australasian Region, with emphasis on medically important mosquitoes. ADULT KEY Author: Potter, M. A. Identification key to the genera of adult mosquitoes in the PACOM Indomalayan Region, adapted from Harbach and Sandlant with the addition of Verrallina. LARVA KEY Author: Gaffigan, T. V. Identification key to the genera of larvae in the PACOM Indomalayan Region, adapted from Harbach and Sandlant with the addition of Verrallina. ADULT KEY Author: Huang, Y. M. Adult identification key to the genus Aedes in the PACOM Indomalayan Region, with emphasis on medically important mosquitoes. LARVA KEY Author: Huang, Y. M. Larval identification key to the genus Aedes in the PACOM Indomalayan Region, with emphasis on medically important mosquitoes. ADULT KEY Author: Rueda, L. M. Adult identification key to the species/groups of Myzorhynchus Series of Anopheles (Anopheles) in the PACOM Indomalayan Region, with emphasis on medically important mosquitoes. LARVA KEY Author: Pecor, J. 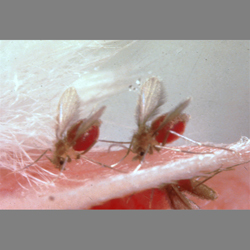 Key to larvae of Anopheles (Anopheles) Myzorhynchus series in the PACOM Indomalayan Region, with emphasis on medically important species. ADULT KEY Author: Rueda, L. M. Adult identification key to the species/groups of Myzomyia Series of Anopheles (Cellia) in the PACOM Indomalayan Region, with emphasis on medically important mosquitoes. LARVA KEY Author: Pecor, J. Key to larvae of Anopheles (Cellia) Myzomyia series in the PACOM Indomalayan Region, with emphasis on medically important species. ADULT KEY Author: Rueda, L. M. Adult identification key to the species of Neocellia Series of Anopheles (Cellia) in the PACOM Indomalayan Region, with emphasis on medically important mosquitoes. LARVA KEY Author: Pecor, J. Key to larvae of Anopheles (Cellia) Neocellia series in the PACOM Indomalayan Region, with emphasis on medically important species. ADULT KEY Author: Rueda, L. M. Adult identification key to the species/groups of Neomyzomyia Series of Anopheles (Cellia) in the PACOM Indomalayan Region, with emphasis on medically important mosquitoes. LARVA KEY Author: Pecor, J. Key to larvae of Anopheles (Cellia) Neomyzomyia series in the PACOM Indomalayan Region, with emphasis on medically important species. ADULT KEY Author: Rueda, L. M. Adult identification key to the species/groups of Pyretophorus Series of Anopheles (Cellia) in the PACOM Indomalayan Region, with emphasis on medically important mosquitoes. LARVA KEY Author: Pecor, J. Key to larvae of Anopheles (Cellia) Pyretophorus series in the PACOM Indomalayan Region, with emphasis on medically important species. ADULT KEY Author: Rueda, L. M. Adult identification key to the series of genus Anopheles in the PACOM Indomalayan Region, with emphasis on medically important mosquitoes. LARVA KEY Author: Pecor, J. Larval key to subgenera and series of Anopheles in the PACOM Indomalayan Region, with emphasis on medically important series. ADULT KEY Author: Rueda, L. M. Adult identification key to the genus Coquillettidia in the PACOM Indomalayan Region, with emphasis on medically important mosquitoes. LARVA KEY Author: Gaffigan, T. V. Larval identification key to the genus Coquillettidia in the PACOM Indomalayan Region, with emphasis on medically important mosquitoes. ADULT KEY Author: Pecor, J. Adult key to Culex Subgenera in the PACOM Indomalayan Region, with emphasis on medically important subgenera..
LARVA KEY Author: Pecor, J. Larval key to Culex Subgenera in the PACOM Indomalayan Region, with emphasis on medically important subgenera.. ADULT KEY Author: Pecor, J. Key to adult females of Culex (Culex) in the PACOM Indomalayan Region, with emphasis on medically important species. LARVA KEY Author: Pecor, J. Key to larvae of Culex (Culex) in the PACOM Indomalayan Region, with emphasis on medically important species. ADULT KEY Author: Pecor, J. Key to adult females of Culex (Oculeomyia) in the PACOM Indomalayan Region, with emphasis on medically important species. LARVA KEY Author: Pecor, J. Key to larvae of Culex (Oculeomyia) in the PACOM Indomalayan Region, with emphasis on medically important species. ADULT KEY Author: Rueda, L. M. Adult identification key to the genus Mansonia in the PACOM Indomalayan Region, with emphasis on medically important mosquitoes. LARVA KEY Author: Gaffigan, T. V. Larval identification key to the genus Mansonia in the PACOM Indomalayan Region, with emphasis on medically important mosquitoes. ADULT KEY Author: Potter, M. A. Author: M. A. Potter. Identification key to the genera of adult mosquitoes from the the PACOM Oriental Region, adapted from Harbach and Sandlant with the addition of Verrallina. LARVA KEY Author: Gaffigan, T. V. Identification key to the genera of larvae in the PACOM Oriental Region, adapted from Harbach and Sandlant with the addition of Verrallina. ADULT KEY Author: Huang, Y. M. Adult identification key to the genus Aedes in the PACOM Oriental Region, with emphasis on medically important mosquitoes. LARVA KEY Author: Huang, Y. M. Larval identification key to the genus Aedes in the PACOM Oriental Region, with emphasis on medically important mosquitoes. LARVA KEY Author: Pecor, J. Key to larvae of Anopheles (Anopheles) Myzorhynchus series in the PACOM Oriental Region, with emphasis on medically important species. LARVA KEY Author: Pecor, J. Key to larvae of Anopheles (Cellia) Myzomyia series in the PACOM Oriental Region, with emphasis on medically important species. LARVA KEY Author: Pecor, J. Key to larvae of Anopheles (Cellia) Neocellia series in the PACOM Oriental Region, with emphasis on medically important species. ADULT KEY Author: Rueda, L. M. Adult identification key to the species/groups of Neomyzomyia Series of Anopheles (Cellia) in the PACOM Oriental Region, with emphasis on medically important mosquitoes. LARVA KEY Author: Pecor, J. Key to larvae of Anopheles (Cellia) Neomyzomyia series in the PACOM Oriental Region, with emphasis on medically important species. ADULT KEY Author: Rueda, L. M. Adult identification key to the species/groups of Pyretophorus Series of Anopheles (Cellia) in the PACOM Oriental Region, with emphasis on medically important mosquitoes. LARVA KEY Author: Pecor, J. Key to larvae of Anopheles (Cellia) Pyretophorus series in the PACOM Oriental Region, with emphasis on medically important species. ADULT KEY Author: Rueda, L. M. Adult identification key to the series of genus Anopheles in the PACOM Oriental Region, with emphasis on medically important mosquitoes. LARVA KEY Author: Pecor, J. Larval key to Anopheles subgenera and series in the PACOM Oriental Region, with emphasis on medically important mosquitoes. ADULT KEY Author: Gaffigan, T. V. Identification key to the adults of Armigeres subgenera and species in the PACOM Oriental Region, with emphasis on medically important species. ADULT KEY Author: Rueda, L. M. Adult identification key to the genus Coquillettidia in the PACOM Oriental Region, with emphasis on medically important mosquitoes. LARVA KEY Author: Gaffigan, T. V. Larval identification key to the genus Coquillettidia in the PACOM Oriental Region, with emphasis on medically important mosquitoes. ADULT KEY Author: Pecor, J. Adult key to Culex Subgenera in the PACOM Oriental Region, with emphasis on medically important subgenera..
LARVA KEY Author: Pecor, J. Larval key to Culex Subgenera in the PACOM Oriental Region, with emphasis on medically important subgenera.. ADULT KEY Author: Pecor, J. Key to adult females of Culex (Culex) in the PACOM Oriental Region, with emphasis on medically important species. LARVA KEY Author: Pecor, J. Key to larvae of Culex (Culex) in the PACOM Oriental Region, with emphasis on medically important species. ADULT KEY Author: Pecor, J. Key to adult females of Culex (Oculeomyia) in the PACOM Oriental Region, with emphasis on medically important species. LARVA KEY Author: Pecor, J. Key to larvae of Culex (Oculeomyia) in the PACOM Oriental Region, with emphasis on medically important species. ADULT KEY Author: Rueda, L. M. Adult identification key to the genus Mansonia in the PACOM Oriental Region, with emphasis on medically important mosquitoes. LARVA KEY Author: Gaffigan, T. V. Larval identification key to the genus Mansonia in the PACOM Oriental Region, with emphasis on medically important mosquitoes. ADULT KEY Author: Potter, M. A. Identification key to the genera of adult mosquitoes in the PACOM Palearctic Region, adapted from Harbach and Sandlant with the addition of Verrallina. LARVA KEY Author: Gaffigan, T. V. Identification key to the genera of larvae in the PACOM Palearctic Region, adapted from Harbach and Sandlant with the addition of Verrallina. 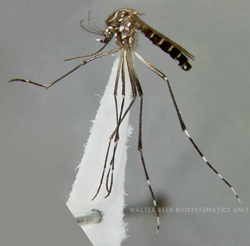 ADULT KEY Author: Huang, Y. M. Adult identification key to the genus Aedes in the PACOM Palearctic Region, with emphasis on medically important mosquitoes. LARVA KEY Author: Huang, Y. M. Larval identification key to the genus Aedes in the PACOM Palearctic Region, with emphasis on medically important mosquitoes. ADULT KEY Author: Rueda, L. M. Adult identification key to the species/groups of genus Anopheles in Eastern Palearctic Region (PACOM), with emphasis on medically important mosquitoes. LARVA KEY Author: Pecor, J. Larval identification key to the species/groups of genus Anopheles in the PACOM Eastern Palearctic Region, with emphasis on medically important species. ADULT KEY Author: Pecor, J. Adult key to Culex Subgenera in the PACOM Eastern Palearctic Region, with emphasis on medically important subgenera. LARVA KEY Author: Pecor, J. Larval key to Culex Subgenera in the PACOM Eastern Palearctic Region, with emphasis on medically important subgenera. ADULT KEY Author: Pecor, J. Key to adult females of Culex (Culex) in the PACOM Eastern Palearctic Region, with emphasis on medically important species. LARVA KEY Author: Pecor, J. Key to larvae of Culex (Culex) in the PACOM Eastern Palearctic Region, with emphasis on medically important species. ADULT KEY Author: Pecor, J. Key to adult females of Culex (Oculeomyia) in the PACOM EasternEastern Palearctic Region, with emphasis on medically important species. LARVA KEY Author: Pecor, J. 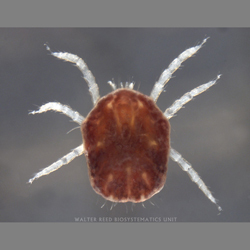 Key to larvae of Culex (Oculeomyia) in the PACOM Eastern Palearctic Region, with emphasis on medically important species.